This bag was designed to fill my needs for a gym class I was taking. It turned out great for a weekend getaway. The divided compartments made keeping organized easy and they kept my shoes out of my clothing. The secure zipper closure kept everything in the bag. Cut two 20" by 16" pieces of the main fabric for the front and back of the bag. Cut two 20" by 7" pieces of the main fabric for the top and bottom of the bag—Cut one of the pieces in half lengthwise for the zipper. Cut two 16" by 7" pieces of the main fabric for the sides of the bag. Cut two 20" by 16" pieces of lining for the front and back of the bag. Cut two 20" by 7" pieces of the lining fabric for the top and bottom of the bag—Cut one of the pieces in half lengthwise for the zipper. Cut two 16" by 7" pieces of the lining fabric for the sides of the bag. Cut one piece of Lycra/Spandex 24" by 9" For the bottle pocket. Cut one piece of Lycra/spandex 24' by 21". Fold the 24" length in half to form a 12" by 21 " piece. Measure in 1" on both sides of unfolded 21" edge. Draw a line from the 1" in mark to the top folded corner and cut on the line so that the folded edge of the rectangle is longer than the bottom edge. Cut the webbing into two even pieces and melt or zig-zag the ends to stop the webbing from fraying. Fold the 24" by 9" piece of Lycra/Spandex in half to form a 12" by 9" Piece. Keeping the fold on the top, sew two lines of basting stitches along the bottom of the fabric. Lay the folded fabric on an end piece of lining. Gather the basting stitches to the middle to make the pocket fabric fit the lining. Baste the pocket to the end on the three unfolded edges of the bottle pocket. Line up the unfolded edges of the folded pocket with the bottom edge of a lining front or back piece. Baste the edges of the pocket to the edge of the lining. Mark the center of the pocket and the center of the lining. Sew a line of stitching down the center of the pocket to divide it into two equal sections. Sew an optional zippered pocket in the other side lining as described here. Match the ends of the bottom lining piece up to the ends of the sidelining pieces. Sew them together using a 1/2" seam allowance. Line up one side of the connected lining with the sides and bottom of a front lining piece. Repeat for the back of the bag lining. Using the top fabric and lining pieces that were cut in half lengthwise, sandwich the zipper tape between the right sides of the lining and fabric, lining up the edges the fabric and the zipper tape. Using a 3/8" seam guide, sew a sew to hold the fabrics and zipper together. Press the fabric back from the zipper to expose the zipper. Top stitch near the sewn edge, sewing through both fabrics and the zipper tape. Measure the finished piece to be sure it measures 20" by 7". Trim if needed or take apart to correct your seam allowances. Optional: Sew piping to the front and back panel if desired. Sew ends and bottom of the bag together on the short ends as you did the lining. 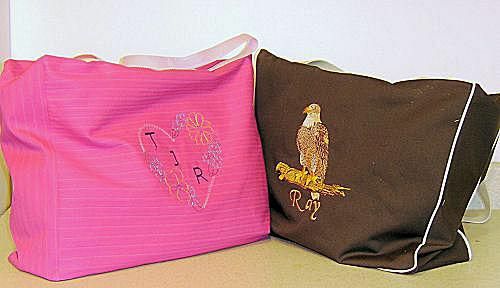 Sew the ends and side piece to the front of the bag, clipping and pivoting at the corners as needed. Apply a seam finish to the seam allowances. Measure in 4" from the side seam on the top edge. Baste the straps to the top of the bag lining the outer edge of the straps up with the 4" marks. Insert the lining into the body of the bag, lining up the top edges. Turn so the lining is out. Open the center of the zipper in the top piece. Line up the edges of the top of the bag with the edges of the top zipper piece. Sew together using a 1/2" seam allowance. Clip as necessary.